Carlsen is the reigning World Champion and arguably the strongest player who ever lived. 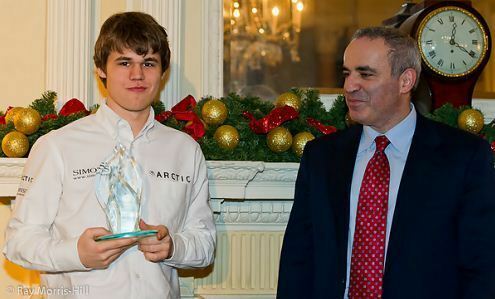 In 2013, at the age of 22, he defeated Viswanathan Anand to become the second youngest undisputed World Champion in history (Garry Kasparov beat him by a few months), though he’d already been the man to beat for the previous three years. He followed that up by claiming both the World Rapid and Blitz Championships in June 2014 before defending the big title against Anand in November 2014 and Sergey Karjakin in November 2016. A child prodigy who memorised the names and populations of Norway’s 430 municipalities as a five-year-old, Magnus claimed the grandmaster title at 13 and was christened “the Mozart of Chess” by the Washington Post. His progress never stopped, and on the 1st January 2010, aged 19, he became the youngest player in history to rank as world no. 1. Although he disappointed many chess fans later that year by announcing his withdrawal from the World Championship cycle he went on to open up a huge ratings gap over his rivals and eventually surpassed Garry Kasparov’s record 2851 rating. Kasparov actually coached Carlsen for a year in 2009/10, but stylistically they could hardly be more different. Claiming to work little outside of tournaments, Carlsen often chooses what seem to be harmless opening moves, but then time and again outplays his opponents from equal or worse positions. Many already consider him the greatest endgame player of all time, and his technical skill and Nordic cool conceal a ferocious will to win. Away from the board Carlsen could easily be mistaken for an absolutely average guy, but despite a slightly withdrawn character he’s perhaps the one chess player since Kasparov to achieve global recognition – tournament winnings and a modelling contract for the fashion label G-Star have made him a multi-millionaire, while he’s also made American TV appearances on 60 Minutes and The Colbert Report. Carlsen’s tournament successes in the years running up to his World Championship match cemented his position as the de facto leader. After winning the Biel Tournament in 2007 he consistently came out on top in the very best events, including Wijk aan Zee (2008, 2010 and 2013), Nanjing (2009, 2010), the Bilbao Masters (2011, 2012), the London Chess Classic (2009, 2010 and 2012) and the Tal Memorial (2011, 2012). He also won the World Blitz Championship in 2009 and each chess Oscar from that year onwards. The World Championship was all that remained. Despite showing more vulnerability than we’ve grown accustomed to Carlsen squeezed to victory in the London Candidates to qualify for a showdown in Chennai, India against Viswanathan Anand. His start was hesitant, but after wins in Games 5 and 6 he eased to a 6.5:3.5 victory. The classical World Championship title simply wasn't enough for Magnus. In June 2014 he asserted his dominance in speed chess by losing only twice in 5 days and 36 games to finish in clear first place in both the Rapid and Blitz World Championships. 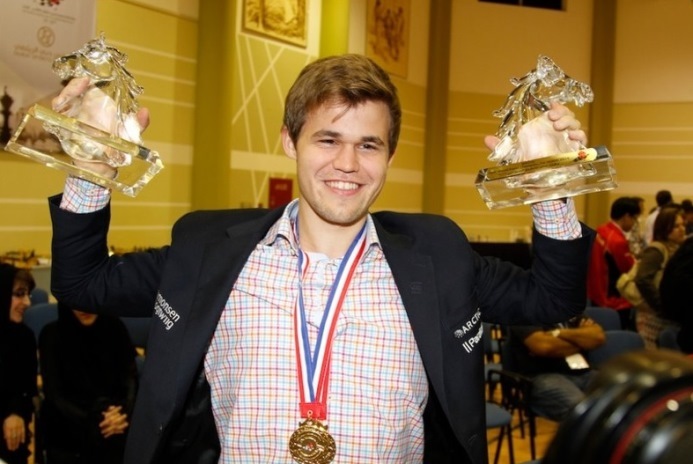 That made him the first player ever to hold the three titles simultaneously - when Carlsen was asked what he can do next he replied simply, "I can do it again!" 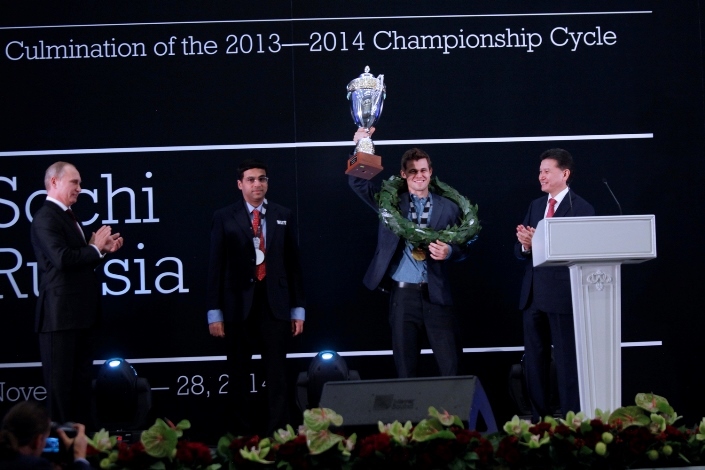 Carlsen had to defend his World Championship title against the same opponent, Anand, in November 2014. The match in Sochi, Russia recalled how Mikhail Tal and Vasily Smyslov faced rematches only a year after beating Mikhail Botvinnik. In the end it did prove much tougher, with the encounter looking all set to go to the final game before Anand overpressed and lost in Game 11, but the champion nevertheless retained his crown: Carlsen 6.5-4.5 Anand. Carlsen finally had the traditional two-year break to the next match, and he carried on as before - winning the majority of events in which he played and maintaining his place at the top of the rating list. Then in November 2016 he finally faced a player other than Vishy Anand in a World Championship match. Few chess fans or pundits gave Sergey Karjakin much chance of winning the match in New York, but the Russian once again demonstrated the strong nerves and tenacity that had seen him win the 2015 World Cup and the 2016 Candidates Tournament to qualify for the match. 50.Qh6+!! Forcing mate next move. So Carlsen had won his third World Championship match and defended his title for a second time. Magnus failed to exert his usual dominance in the following two years and came into the next World Championship match, in London in November 2018, with only a 3-point lead on the rating list over world no. 2 Fabiano Caruana. It was the US star who stood in his way, and after Carlsen missed a big chance in the first game the match ended up being too close to call - for the first time in the history of such matches all the classical games were drawn. As in New York, though, Magnus took over in rapid chess, this time demolishing Fabiano 3:0 in the tiebreaks to mean that he'll now have held onto the title for 7 years before he next needs to defend it in 2020. Magnus ended 2018 as the world no. 1 in classical, rapid and blitz chess, having surpassed Anatoly Karpov's 102 months as world no. 1 on the main rating list. What next? Well, there's still Garry Kasparov to beat, though that may be tough! Garry was no. 1 for an extraordinary 255 months and the World Champion for 15 years. BOOM!! Sergey definitely did not see 50.Qh6+ forcing mate next next move.What a surprise!